Robert de Vaugondy -Carte de L'Asie dressée sur les Relations les plus . . .
Robert de Vaugondy, D. - Carte de L'Asie dressée sur les Relations les plus . . .
Carte de L'Asie dressée sur les Relations les plus . . . - Robert de Vaugondy, D.
Title : Carte de L'Asie dressée sur les Relations les plus . . ..
Map maker : Robert de Vaugondy, D.. Size : 18.5 x 20.6 inches. / 47.0 x 52.2 cm. 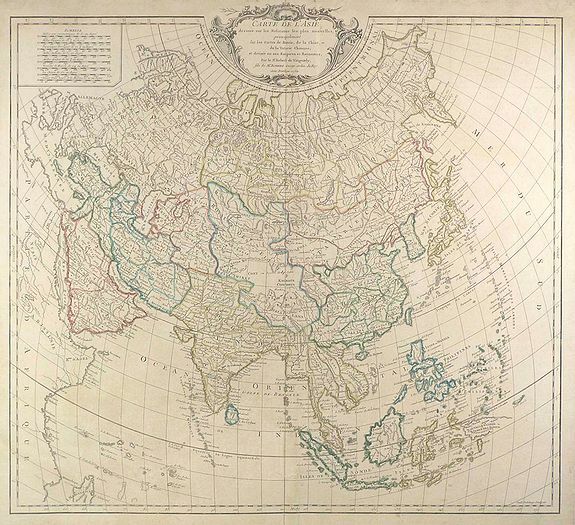 Description :Large map of Asia from Robert de Vaugondy's Atlas Universel. We see major political divisions and the state of European knowledge of the continent in the mid-18th century. Surveys undertaken in Russia and China in the earlier part of the century have added considerably to knowledge of the interior. Coastlines are generally well described, except in Southeast Asia, where much of the eastern reaches are known only in general outline if at all, Similarly, the area north of Japan remains to be explored. Condition : Moderate toning and a few short creases. Closed marginal tears (not affecting the image) and soiling in the upper margin.